The FC and FX tailpipe look identical to the FE, they’re recognizable for a 35mm exit as opposed to the FE’s: 25mm yet they offer no extra noise at all. They added 0.75bhp up to 3/4 revs on a 400. With porting and a race cam, the engine produces a low speed hesitancy with either pipe requiring a ‘straight through’ pipe (Lineaweaver) to cure. The standard 400 has 26mm i/d headers (downpipes) with 27mm exhaust valves fitted. The larger 450/550 engines have 28mm i/d headers. Fit the larger headers to a 400 and you get 1-2 bhp up to half revs. Or 13 x 49. Racing purposes or very steep ascents. Ideal in woods and deep mud-the 14T front means less wear. 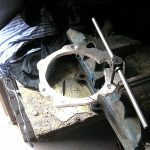 File lower rear chain guide and lower as far as possible by filing the hole oval. Why not go 13T until a new set of C & S are required and then get the extra link? It allows the rider to have excellent engine braking, to never stall on logs, the bike drops into a corner and lifts coming out. 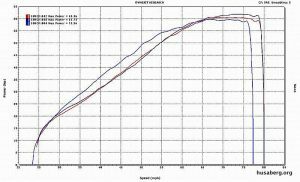 This is a different way to ‘gear’ a bike compared to the CR sixth gear mod below (see Husaberg Engine Tuning). So you’d like to retro fit one to your old nail, right! Only one ‘nutter’ has done it so let’s hear it for Hribman! Try a “Brisk” BOR12LGS. “Pokenhood” reports a 2hp increase! However I hear that after a fall they can be hard to re-start. Try an “Iridium” by Nippon. Aids starting. Code: IXU24. My new Brisk failed to work, not even starting the bike. Less rotating mass. Lumpier at idle but is slightly quicker to rev. Not tiring if the revs are kept down near idle but is very tiring if the bike is revved out. Putting mine back in over this as I need to hold on to gears longer and that really does wear you down! 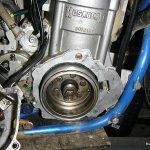 Reference this Husaberg FE400e engine rebuild thread. This idea is from Steve who uses it for testing carburetion, etc. Saves lots of time! Save weight and leak at the seal. Place plastic cap placed between the case and oil seal and silicon in. Bush must be removed or will vibrate out in one ride. 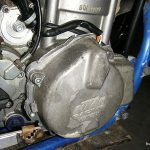 Bike however proved too difficult to start when cold and ate 1-2 sprague bearings per season. Decompression cable-kickstart: Save weight and aesthetics. Siliconed holes in head and long nut/bolt in back of case. Decompression-auto: Save rotating mass in engine. Manual system works with light mod and YTZ7S battery. Decompression cable-bars: Aesthetics/reduce likely damage. Shaft removed at rocker cover, long soft rivet used w/silicon to seal. The re-starter with it’s bracket and wiring harness can be removed easily. There is a plug available to close the crankcase hole (Part No. 220 078-01). This plug has to be fixed from inside the crankcase so the transmission cover has to be removed. Some people who didn’t want to open the crankcase ‘glued’ the plug in using something like Locktite. 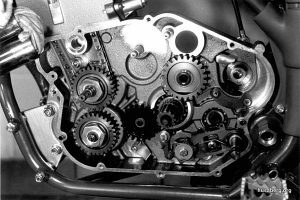 But by removing the transmission cover you will be able to remove the intermediate gearwheel and the freewheel too which are no longer needed for kick-start only use. Although I’ve been told the remaining unused needle bearings will stay in place I fitted two spacers as kind of ‘gearwheel dummies’. 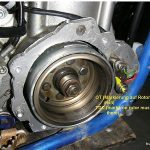 When reassemble the clutch be aware of the right position of the gearwheel markers (crankshaft/clutch hub/driving shaft)! Once the re-starter is removed the battery is unnecessary too. Even if you want to use lights, turn-signals and horn. The battery tray can be removed. It’s very easy and takes just an hour. Disconnect the two wires, remove the battery and all mounts etc. Despite the rumors, the motorcycle will still stop on the kill switch or ignition key. 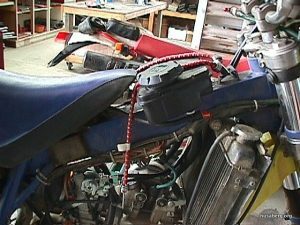 Here’s a how to guide to run your Husaberg motorcycle without a battery. Acres of wiring can be removed. Gear yourself up with soldering iron and connectors. Speedo drive removed: Cable breaks immediately! Don’t repair-remove! Leave drivehead as spacer, spacers available. Speedo cable removed: Cable breaks always and easily! Speedo removed: Remove assembly + “mount”. Use part of mount to support the ignition lock. Use holes in top clamp. Can be removed. Will break eventually! Lightweight. Steel teeth reduced wear. Lineaweaver jetted: And Dale works his magic with the exhaust systems!